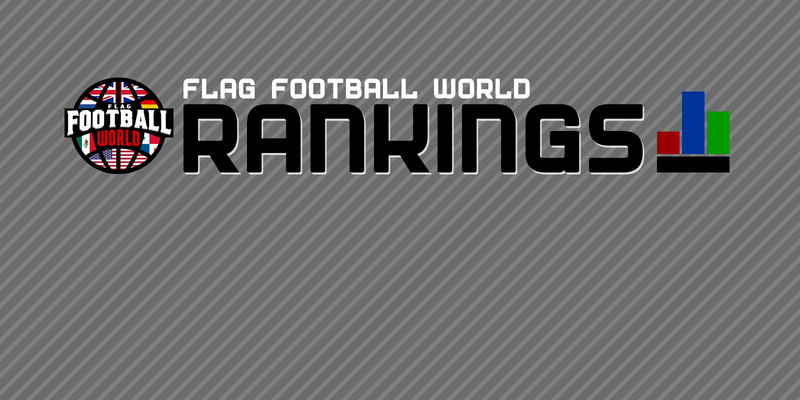 In our most recent updated team rankings, we see some movers and shakers, and one new entry to our list! The Buttonhookers hold on to their top spot in our most recent leaderboard. We’ve seen the Buttonhookers stroll through their schedule with relative ease so far. Their lone-perfect record in the SEC sees them likely to progress as #1 seed from a highly competitive conference. They hold recent victories over our #2 and #3 teams, and sit pretty at #1 in our team rankings. The Rebels have also been putting teams to the sword, and only sit behind the Buttonhookers by virtue of their loss to the Baker Street side in week one. They’ll have a chance to topple the Buttonhookers on July 1st. Until then, they’re sitting at #2 in our countdown. The Broncos wrapped up their playoff spot and division with no fuss whatsoever in week three. Going 3-0 on the day looks great on the surface, but they were given a bit of a scare against the Clyde Comets in a thrilling encounter. We’ll give them a pass as they were down GB Lion Kevin Woods. The Giants have also looked impressive in their victories to date. 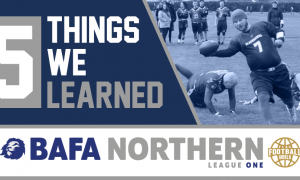 A potentially difficult match-up against the Manchester Crows resulted in a whopping 40-6 win for the Sheffield outfit, while their much anticipated battle against the upstart Manchester Titans saw them pick up another comfortable win. They’re almost a lock for #1 seed from the MEC, as the other teams in the conference have traded wins and losses. So far so good for the Birmingham Lions, as they passed their first real test, but not necessarily with flying colours. A tightly contested 34-30 win for the Lions sees them in pole position to take the #1 seed in the SWC. 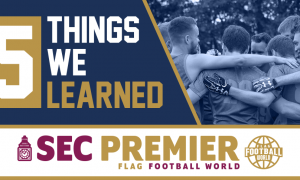 Granted, this was always going to the a tough game however – the Northants Titans have dropped a game already this year to Hereford, so this game was really their chance to get back on track. Birmingham did a nice job of staving off the challenge to remain undefeated. The Aberdeen Oilcats have quietly been in impressive form this year. If they can get their strongest five on the pitch, they’re a force to be reckoned with. GB Lion Gary Elliot is putting together arguably one of his best ever seasons. As long as he’s on the field, the Oilcats have a chance to beat anyone. The Stampede have moved down slightly, but only to make space for the Blackhawks. That being said, their close victory over the Titans White squad raised some eyebrows at FFW HQ. We figured that would have been a routine victory, but they made life hard for themselves. That being said, they did go 2-0 on their most recent game day, and are looking good for a playoff berth. They could potentially stun us all and win the division. The Stampede have Big Bowl up next! Similar to the Stampede, the Hurricanes move down slightly, but only be virtue of the Blackhawks entering the top 10. The former Britbowl champions have been in fine form all season, with one minor blip being their loss to the Stampede. 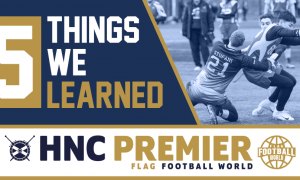 They’ve got tough tests against the Titans Blue, Birmingham Lions, Coventry Cougars Mixed before they take on the Stampede on the final game day of the season. If the Hurricanes can pick up victories in these huge fixtures, then they’ll have bags of confidence going into the playoffs.